» The Nobel Prize is a set of annual international awards bestowed in a number of categories by Swedish and Norwegian institutions in recognition of academic, cultural, and/or scientific advances. 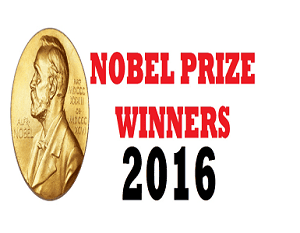 » The will of the Swedish inventor Alfred Nobel established the prizes in 1895. The prizes in Chemistry, Literature, Peace, Physics, and Physiology or Medicine were first awarded in 1901. » The Royal Swedish Academy of Sciences awards the Nobel Prize in Physics, the Nobel Prize in Chemistry, and the Nobel Memorial Prize in Economic Sciences; the Nobel Assembly at Karolinska Institutet awards the Nobel Prize in Physiology or Medicine; the Swedish Academy grants the Nobel Prize in Literature; and the Nobel Peace Prize is awarded not by a Swedish organisation but by the Norwegian Nobel Committee. Two U.S-based economists, Oliver Hart (U.K) & Bengt Holmstrom (Finland) have been awarded the 'Sveriges Riksbank Prize in Economic Sciences in Memory of Alfred Nobel' for their contributions to contract theory. Colombian President Juan Manuel Santos has been awarded the Nobel Peace Prize for his efforts to end the 52year conflict with left-wing rebels. Japan's Yoshinori Ohsumi has received the 2016 Noble Prize for Medicine. He has received the award "for his discoveries of mechanisms for autophagy". The prize goes jointly to David J. Thouless, F. Duncan M. Haldane, & J. Michael Kosterlitz who discovered a mathematical framework in the field of topography, to explain unexpected properties of solid materials. Awarded to Jean-Pierre Sauvage, Sir J. Fraser Stoddart & Bernard L. Feringa for developing the molecular machine. American singer-songwriter Bob Dylan has been awarded the Nobel Prize in Literature 2016 "for having created new poetic expressions, within the great American song tradition".